Zion Market Research has published a new report titled “Vacuum Interrupters Market by Application (Circuit Breakers, Contactors, Reclosers, Load Break Switches, Tap Changers, and Others) and by End-users (Utilities Sector, Oil & Gas Sector, Mining Sector, Transportation Sector, and Other End Users): Global Industry Perspective, Comprehensive Analysis and Forecast, 2017-2024”. 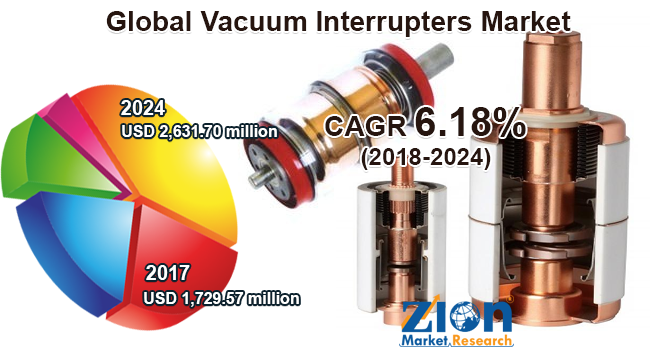 According to the report, the global vacuum interrupters market accounted for USD 1,729.57 million in 2017 and is expected to reach USD 2,631.70 million by 2024, with a CAGR of around 6.18% between 2018 and 2024. Vacuum interrupters were first introduced in 1960. They are the core component of high and medium-voltage circuit breakers that are used for quenching of arc. Vacuum is a good insulating medium is highly used in medium and high-voltage applications. The technology includes several advantages that include low maintenance requirement, low cost of a medium, longer service life, environment-friendly, and faster quenching than any other medium. Since its introduction, the technology has undergone several advancements such as reduction in chamber size along with improved contact geometry. Copper and chromium are the ideal materials used for making contacts of an interrupter. Ongoing huge investments in electricity transmission & distribution in order to reduce power losses in various developing markets of Asia, Africa, and South America is expected to propel the growth of the vacuum interrupters market in the coming years. Urbanization & industrialization tends to increase power need & simultaneously helps to further flourish demand for vacuum interrupters. Replacement & refurbishment of aging infrastructure, a gradual shift of the interrupter market from gas insulation interrupters to gas-free insulators, due to regulations that inhibit the release of greenhouse gases into the atmosphere will further prompt the market growth. However, the risk associated with loss of vacuum is expected to limit the vacuum interrupters market growth. However, ongoing projects and investments in renewable energy across the globe are expected to open significant opportunities in vacuum interrupters market in the forecast period. Contactors dominated application segment of the vacuum interrupters market in 2017. This is owing to an increased awareness for saving electricity by incorporating improved power factor devices into the network coupled with increasing use in switchgear, motor starters, and control gear of medium voltage fast switching device. The circuit breaker is expected to become the most attractive application segment in the upcoming years due to the growing demand for electric power transmission. Utility sector held the largest market share in 2017, the growth of this segment is mainly attributed to increased use in switchyards by transmission & distribution companies. Oil and gas segment is expected to experience significant growth owing to increasing oil and gas plants. However, increasing industrialization is expected to contribute a substantial growth of industry in the coming years. The Asia Pacific was the leading regional market for vacuum interrupters in 2017 followed by North America. Rising urbanization coupled with ongoing electricity transmission & distribution projects is expected to fuel the growth of vacuum interrupters market in near future. South America and Africa are expected to be the most attractive region during the forecast period. Replacement & refurbishment of aging infrastructure will be the key factor to boost the demand for vacuum interrupters in the European region in future. Noticeable players operative in the global vacuum interrupters market is Shaanxi Baoguang Vacuum Electric Device, Wuhan Feite Electronic, Crompton Greaves Limited, Actom, ABB Ltd., Siemens AG, Meidensha Corporation, Mitsubishi Electric Corporation LS Industries, Toshiba, and Eaton Corporation, amongst others.